Sports Minister Harin Fernando yesterday said that he is looking forward to do some revolutionary changes in Sri Lanka Cricket together with the new board members who will be elected in the forthcoming election. 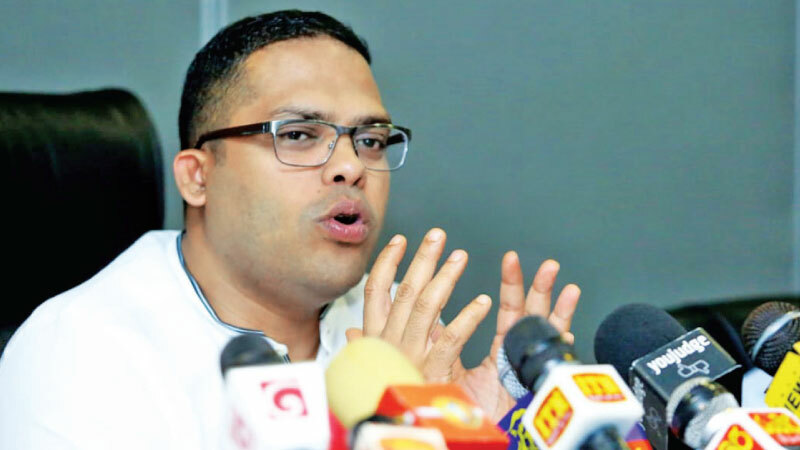 Minister Fernando also said that he does not want to interfere with SLC’s responsibilities and assured that he neither has personal or political agendas when dealing with issues related to SLC. He also expressed his confidence that they would be able to hold SLC elections as planned at a press briefing held at the Sports Ministry yesterday. “We take continuous legal counsel from Attorney General’s Department. Despite the legal action taken against the Appeal Committee decision to reject several nominations, we are hopeful that we won’t be held up by a stay order. If by any chance we are to face a delay, we will have to discuss it with the ICC. Hopefully, the ICC would not go hard at us considering that we would then be facing a legal constraint,” the Minister said. Minister Fernando referring to the recent discussion he had with senior cricket players in the national cricket team, said that it was fruitful. He furthered said that he will be having another round of meeting with the same players next Sunday. “I don’t think we have a problem with our cricketers’ talents. We only have some loss of confidence and other such matters which we can overcome. I think our team is now performing better,” he added. Minister Fernando also said that 25 cricketers have been shortlisted as the pool to participate at Cricket World Cup. “I am yet to receive the list of names.” he added. Minister Fernando also said that he strongly believes that Sri Lanka cricket players should receive excellent payments, despite some social ideology. “We should remember that Sri Lanka has the least paid cricketers in the world than most other cricket playing nations. The ICC gives the SLC the necessary funding. We have to direct them to the improvement of cricket and for the welfare of our cricket players. “Now that cricket has become a professional sport in Sri Lanka, these cricketers cannot do a job. They will have to solely depend on their payments to carry out their livelihood. They can play cricket only for a specific period of time. They cannot go for a job after quitting cricket either. So considering all these facts, we must accept the fact that these cricketers must be paid accordingly,” Minister Fernando explained. The Minister said that they might have to introduce a performance-wise criteria in the future for the post of national cricket team coach. “There is thing called return on investment. If we are investing we need results. This is not to personally target anyone. Our present national coach had faced many issues. He was not allowed to execute his plans. Some people have disrupted his work. So this is not a personal vendetta,” he explained. Speaking further, Minister Fernando said that following a lengthy discussion with the National Sports Council, the Sports Ministry is to establish a “super pool” consisting sportsmen and sportswomen who have high potential to secure international medals. The Ministry is to introduce an insurance scheme to sportspersons as well. He also said that the Sports Ministry is planning to establish sports stadiums, one for each province that will be under the direct purview of the Sports Ministry. The Minister also said that the ministry has called for tenders relating to High Performance Centers which will be prioritized in an endeavour to uplift sports in Sri Lanka. The Minister further said that the Sports Ministry is planning to hold elections to all sports associations during 2019. Asked on the selection process of the Sports Ombudsman, Minister Fernando said that Cabinet is presently looking into it. Sports Ministry Secretary Chulananda Perera and DG Sports Dhammika Muthugala were also present.